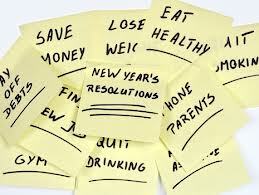 New Year’s resolutions can be tough, and trying to make ‘Christian’ resolutions can be downright dangerous. I say that because it is all too easy to fall into the trap of crafting very well-intended resolutions (I’m going to read my Bible more, give more of my time/money, or generally ‘be a better Christian’) that ultimately are just saying, ‘I’m going to try harder to be better’, which is not an identity shaped by the Gospel. The passage above shows that movement. Because God’s grace in Christ has appeared, therefore we resolve to live as those who have been redeemed. Specifically, I think there are three ‘redeemed resolutions’ that stand out. You might need to do these things, but they’re not what Paul was writing to Titus about. 1. Resolve to say ‘No’ to ungodliness, and ‘Yes’ to righteousness. 2. Resolve to zealously pursue good works. Even more than the topic of personal holiness, the relationship between faith and works has been debated throughout the history of the Church. Again, without trying to parse it all out here, Paul describes those who have been redeemed as those who are “eager to do what is good.” Good works are not a part of our salvation, but they are a necessary part of our discipleship. 3. Resolve to wait with confident hope for Christ’s return. The psalmist says, “My soul waits for the Lord more than watchmen wait for the morning, more than watchmen wait for the morning” (130:6). Specifically, we are waiting for Christ’s re-Advent, his second coming and return. It’s what Paul calls here “the glorious appearing of our great God and Savior, Jesus Christ” (stunning Christology in that little verse, by the way–Jesus is explicitly called ‘God’). This is our “blessed hope”, which is far different than wishful thinking. As Calvin said, “Hope is the sure and certain expectation of those things which faith believes to be truly promised us by God.” Resolve to wait for what God has promised to do. So if you’re still looking for some good resolutions (of if you’ve already broken the first ones you made), go ahead and take these up for 2013. I am.